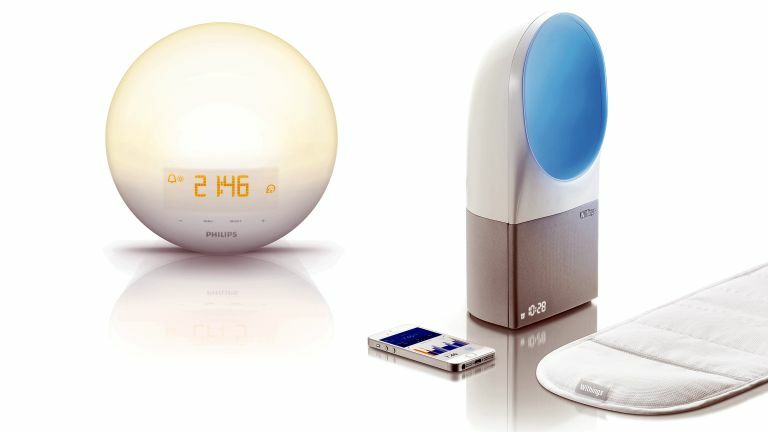 T3 Smackdown: Withings Aura vs Philips Wake Up Light - which is best? Both these lights claim to help you sleep better and wake you more peacefully, but which works better? Wake-up lights are a relatively new phenomenon, but a welcome one. Especially in winter when it's especially cold, dark, and very difficult to get out of bed. Using LED lights to simulate sunrise and sunset, not unlike the lamps you get tp combat seasonal affective disorder (the aptly acronymed SAD), these also play soothing sounds to help gently lull you into slumber and raise you from. We pitted the Withings Aura (£150 for alarm only or £250 for alarm with a full-on, sleep-tracking sensor pad) against the Philips Wake-Up Light HF3520 (£130), and hunkered down for a, hopefully, decent night's kip. • Cup of coffee, sir? You look knackered. The Withings is more advanced in this respect – you tap the top to turn on the light, long-press to start a sleep program and stroke the side to adjust the volume and brightness. Not only that, you also set the alarm using an app on your phone, which is both a blessing and a curse: it's handy for setting it before you go to bed, or if you're already reading something on your phone; but forget to, and it might mean getting out of bed. Which is something we're not big fans of. This has a series of touch buttons on the lamp face for menu, alarm time and which sounds you hear. But its physical buttons – alarm one and two, radio, lamp and go-to-sleep functions – are around the edge, so you have to lean over the device to see what you're pressing. It's about as user-friendly as trying to find a port on the back of your telly. Though in its defence, you do just tap the lamp face to snooze the sound, which is about all we're capable of first thing in the morning. Despite looking like it has a big, ovular bulb in the photos, the Withings actually has a cavity where the light shines out, sort of like a ship's funnel. Withings claims the blue light decreases the body's melatonin production, helping you wake up gradually, but it felt too clinical for our taste. It was a little like the blue light from a projector, which reminded us of too many PowerPoint presentations. And its red go-to-sleep light was a bit like being in a darkroom. The Withings has way more choice when it comes to sound – it syncs to Spotify to stream over 20,000 radio stations plus sleep playlists (but only if you have Spotify Premium). The Philips emits a much warmer orange light that's more pleasant and feels more natural.And while the Philips only has a humble FM radio, complete with an aerial you have to adjust to stop the crackling, its five preset wake-up noises sound much more natural and pleasing to wake up to than Withings'. How well does it help you sleep? Both let you play the radio to wind down, with sound and light dimming over an adjustable time period. But the Withings also comes preloaded with its own sleep program of soothing wave sounds – handy if there's nothing suitably soporific on the radio. With the Philips, you're stuck with the radio, and only FM at that. Of course you don't have to have sound on either, you can just have the light dim instead. Both do a pretty good job of mimicking sunset, and the sensation of light dimming and sound growing fainter really helped us switch off. But as we've already said, we preferred the Philips' orange light. How well does it wake you up? Again, the basic functionality is the same for both. You choose what time you'd like to wake up, and instead of jolting you awake with a harsh alarm, both fade light in to mimic sunrise. At your chosen wake time, the light reaches your desired level of brightness, and your selected sound starts playing (this too gradually increases until it reaches your preset volume, so as not to wake you too harshly). On both devices, you can set how long it takes the light to reach your desired level of brightness – 20 minutes, say – so you can wake gradually over a long time if you like. Although this uses a sophisticated, under-mattress movement and temperature sensor to, at least in theory, commence waking you at a more optimum time, the Aura didn't noticeably perform better than the Philips.Over the weeks we spent testing, we generally woke once or twice during the fade-in period, but promptly fell back asleep. We were then woken again when the sound kicked in, and stayed awake. Both left us feeling more rested and were far more pleasant than a normal alarm, especially when it's still dark outside. For us, the Philips just edges this. If you don't want to go to the bother of connecting to Spotify – which frankly, we didn't – the Withings only has one wake-up sound, a tune that's decidedly new-age. Whereas the Philips has five, including birdsong, a cuckoo, waves, piano chords, and yes, a new-age tune. Seems there's no escaping them. We tested the full alarm + sleep tracker package from Withings. The sleep tracker is a mat that you slip under your mattress which analyses your sleep patterns – it gives you information like how long you slept for, your varieties of sleep cycle (deep, light and REM) and how long it took you to get to sleep. It syncs to the Aura and thus can wake you at the optimum time of your sleep cycle – so 6:45 instead of 6:30, say, if it means not yanking you out of a deep sleep. Through its Healthmate app, the Withings also tells you the temperature of your bedroom, how bright it is and the sound levels. The theory is, if you're having trouble sleeping, these will help you figure out why. Long story short: we found these to be largely useless. Like the Withings, the Philips features a clock display whose brightness adjusts depending on the room, so it'll be dim in the dark, and brighter during the day. The Philips has a USB port for charging a phone. And there is a £180 model (HF3550) that comes with an iPod dock, so you can control it through an app. Apart from that, the Philips lacks any extra bells and whistles. But to be honest, if it's on our bedside table, the simpler it is the better. Neither of these products is exactly cheap, but we'd take either over a harsh alarm in the dark. For its price, ease of use, warmer light and more natural wake-up sounds, the Philips is the clear victor. For the next model, we'd like Philips to lose the buttons around the edge, please. It's supposed to help us get to sleep, not make us fiddle around trying to find the right button. For us, the Withings tries to do too much. It means the wake-up light and sounds play second fiddle to fancy app integration and an abundance of pointless sleep data.There's nothing wrong with the Aura, and the way it ties into Withings' eco system is neat, but Philips' Wake Up Light offers better core functionality for less.